Stumbled across this story by accident when I was researching something else. It turns out that there is a big market of people looking to buy Vancouver’s (and Victoria’s and anywhere else’s) older homes — and newer homes — that are being demolished for something grander. The problem is: owners seem unaware or uninterested. So they continue to be demolished and/or recycled into sawdust. Okay, deep breath here as I try to provide some insight into candidates in one of the most complex civic elections in Vancouver’s history. A word about the limits I’m working under, first. Usually when I do my little voting guide in the election, I can assess the performance of many of the candidates because they’ve been on the public stage at council, school board, or park board or in community groups, fighting for some kind of change. Finally, this election is, more so than the others I’ve covered in 25 years at the city, about trying to sort out the ideology and identity of all the new parties and candidates. Before, we had right, left, and really left, for the most part. The question for many was a simple, almost binary choice about right or left, with some consideration given to who were the most credible candidates in those groups. Now, people are curating much more nuanced lists, picking candidates by using many more vectors: young/experienced; male/female/other; party/independent; ethnicity; environmentalism/not; ideology, but way more fractured this time, with parties ranging from hard left to looks left but makes weird decisions to libertarian right to soft right to right mixed up with typically lefty housing policy. For many, a simple right-left doesn’t work. The diehard COPE voters will never vote for anyone Vision, no matter what the Vancouver and District Labour Council says, seeing them as neoliberal sellouts. People inclined to support Vision in the past will be wary of voting for what they see as unreconstructed and unrealistic radicals, like COPE. On the right, the divisions are equally profound, with some seeing the traditional NPA as part of the problematic status quo, while some of those old-time NPAers are unlikely to support candidates who seem too extreme. One of the big issues in this campaign season has been the discovery of holes and glitches in the province’s new campaign-finance law for local elections. It turns out third parties can spend whatever they want up until 30 days before the election, independent candidates who are a team but don’t register as an official party can accept more in donations than a party, unions can pay staff to campaign among their members without any declaration of spending, and more. For the last six months, that’s been a dominant theme, starting with this story back in April about the NPA raising money for “operating expenses,” something that was not limited until the NDP decided to amend this bit in June. So, as everyone in Vancouver who cares anything about local politics knows, Vision Vancouver’s campaign turned into chaos this week after the surprise announcement that mayoral candidate Ian Campbell was withdrawing from the race. There is a core group in Vision Vancouver that believes the party is still strong, still has a solid voter base, and, very importantly, is not able to raise money without a mayoral candidate. So there is lots of chatter about finding another mayoral candidate by Friday. I got this email message from Andrea Reimer, who, after saying she was quitting politics altogether, is now considering running as the mayoral candidate. It illustrates the views of some in the party who believe having a candidate is key. The last thing I thought I would be thinking about at this point in the 2018 election is running for mayor but it’s been anything but a predictable election. I supported Ian Campbell, and it’s been a hard week. But now Vision is without a candidate and friends and colleagues have contacted me and urged me to reconsider my decision and become visions nominee for mayor. I owe it to them, and the city and agenda I have worked hard for almost two decades now to seriously consider, so that’s what I am doing. Vision is the best bet to stop the NPA. The internal polling is pretty clear: an independent can’t win and there is too much at stake to not take that reality seriously. That view is, of course, frustrating to the campaign people for the two independent candidates on the left — Kennedy Stewart and Shauna Sylvester — who think that Vision is alienating the other left/progressive parties (Green, OneCity, COPE) by, as they see it, sticking to an arrogant view that it is the natural governing party. Lots of phone calls and persuading going on as people debate whether Vision should just stay out of the race and support one of the two independents or let various Vision reps decide on their own who to support or what. As I’ve remarked a couple of times, I’ve seen a revolution unfold in Vancouver the last couple of years — something I thought I’d never see. That revolution is powered by a new generation of people who’ve gotten interested in housing and who have made it a mission to lobby for new development as a way of making room for more people to live here. 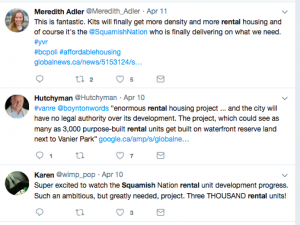 The effects of that YIMBY movement, as it’s sometimes called, are clear in the motion that Mayor Gregor Robertson threw out a couple of weeks ago when he asked that city staff pursue even more aggressive efforts to look at incorporating everything from triplexes to stacked townhouses to small apartment buildings into the city’s single-family areas. My story for the Globe was an effort (incomplete, missing some nuance) to see where the multiple candidates and parties, in this crowded election-year field, stand on this. Some support the idea with no caveats. (Vision, Yes Vancouver) Some support it with cautions (needs more emphasis on affordability), like One City. 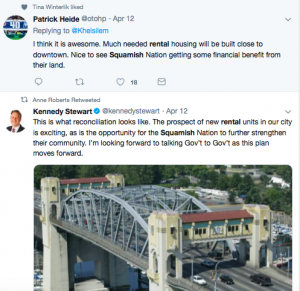 Some support it with even stronger cautions (can’t do this process at all the way the mayor has framed it, needs much more public consultation to make sure it doesn’t override neighbourhoods or fuel even more speculation): Green Party, ProVancouver. And others seem dead-set against it for multiple reasons. The NPA’s George Affleck, COPE. Wherever people fall, it’s still mind-boggling to think that Vancouver can even discuss this. As many councillors can tell you, there were near riots on the west side a couple of decades ago when someone suggested subdividing a Mackenzie Heights lot to allow three houses instead of one. I started my coverage of city hall in the mid-’90s when the basement-suite battles were still going on. The new council, which may take a year to figure out Robert’s Rules of Orders and what FSR is, likely won’t be moving on this initiative too quickly. But it’s on the table and, if it doesn’t pass in this high tide of housing concern, will likely float to shore the next time.